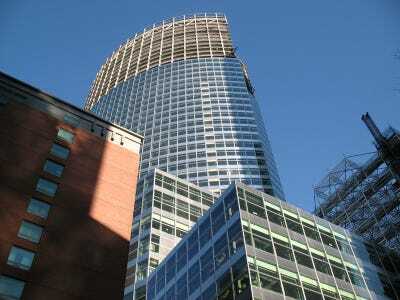 It’s no secret that Goldman traders love their new headquarters. The interiors are physically beautiful. When we were there recently, the reception lobby–called the Sky Lobby–reminded us of the alien spaceship in the remake of V.
The traders like having everyone in one place. That’s true. And it’s also what Goldman is comfortable with you knowing. But if you catch a Goldman trader under the influence of a good day on the markets and a long night at the bar, you might get another story. That’s what happened to us in a lower Manhattan watering hole earlier this week. “The best thing about the new building: no rats,” the trader said. He went on to explain that late at night, he sometimes looked up at the lighting and saw rats scurrying across. “You could hear them even when you couldn’t see them. It skeeved me out every time,” he said. We asked how long the building would remain rat free. He told us that the rumour on the floor is that some kind of sophisticated, high tech anti-rat technology is being employed. “But I don’t think it will work. Rats have their ways,” he said.